Let's face it. Planning for a healthy financial future is not the activity of choice for most individuals. If each of us had our way. the various pieces of our financial lives would magically fall into place. all of our financial needs would be met effortlessly without our having to devote event a minute of time to planning. Retirement isnt' what it used to be. In many ways, its better. People are living longer and enjoying healthier and more active retirement years. On the financial side, however, trends are not as positive. For a combination of reasons, the goal of a financially secure retirement is becoming increasingly difficult to achieve. Catastrophes can be a financially devastating event if proper protection planning has not been done. Insurance is a tool that enables people to guarantee the financial security of those who depend on them. Without the necessary insurance coverage, catastrophes could lead to financial hardship. America is the land of opportunity, a place where we can make many of our dreams come true. Helping our children obtain a college education is one of the tools they need to make their dreams become a reality. Real estate ownership is a dream for many Americans, but with our help, we can make this dream a reality. Whether you are buying or selling your home, upgrading to a better home, or exchanging rental properties, the EAS team can help you find a property that is right for you. If you don't take care of your estate, the IRS will. When Elvis Presley died, his estate was worth more than $10 million. His daughter received less than one-third of that. When Karen Carpenter died, her $6 million estate only netted her heirs about $1 million. 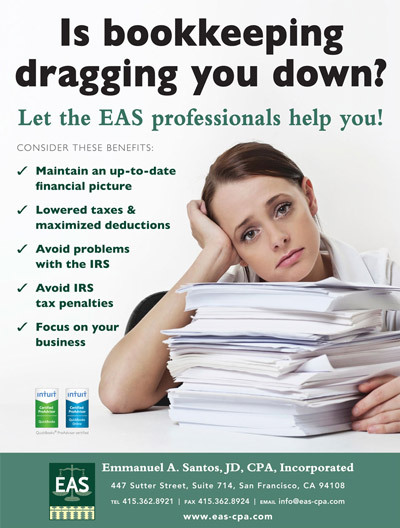 Selecting the right tax professional can make a huge difference in maximizing your deductions and minimizing taxes. Emmanuel A. Santos, JD, CPA, Incorporated is equipped with the knowledge and expertise you need to handle your complex tax and financial situaltion. Owning a business is a hard job, but adding accounting work to a business owner's responsibility may take away valuable time from the business preventing it to grow. Since 1996, we have been helping business owners with bookkeeping tasks so they can focus on their businesses and make them grow. Planning is critical to successfully starting and building a business. We can get you started on this very important activity by providing you with guidance, tools, and resources necessary to write a winning business plan. Once your business is up and running, you'll need to regularly review and update your plan to manage growth. Emmanuel A Santos JD CPA, Incorporated offers a full range of accounting services including bookkeeping for small to medium size businesses. We also provide financial analysis and other management advisory services as needed. Our goal is to help relieve you of the burden of mundane data entry, bookkeeping and tax compliance issues every small business faces. 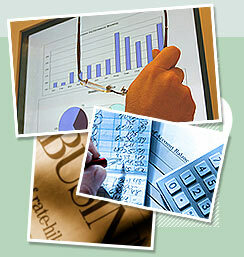 We will work closely with you in developing the most efficient reliable accounting system for your particular needs. As such, you could concentrate on doing what you do best and allowing your business to grow. Click here to see what our clients have to say about our services.